Deciduous, erect, large shrub, 1-6 m tall; twigs thick, soft, pithy, usually somewhat glaucous; bark dark reddish-brown, warty. Opposite, stalked, large, compound, pinnately divided into 5-7 elliptic to lanceolate leaflets, often asymmetric at the base, abruptly sharp-pointed at the tip, saw-toothed on the margins, and usually somewhat hairy beneath. Inflorescence of numerous, small flowers in a 4-10 cm long, egg-shaped to conical cluster with short lateral branches on a stronger central axis; corollas white or cream, wheel-shaped; petals fused at base into a short flat tube that spreads (3-6 mm across) at the top to 5 lobes, the lobes longer than the tubes and becoming reflexed. Berrylike, globose, 5-6 mm across, shiny red or purplish-black, occasionally brown, yellow, or whitish, but not glaucous, with 3 small, smooth to wrinkled or pebbled stones, each enclosing a seed. Moist to mesic meadows, ditches, streambanks, grasslands, shrublands, disturbed areas and forests in the lowland, steppe and montane zones; var. ar­borescens is common in and W of the Coast-Cascade Mountains, var. melanocarpa is common E of the Coast-­Cascade Mountains and less frequent to the W of them, var. leucocarpa is infrequent in SC and SE BC; var. 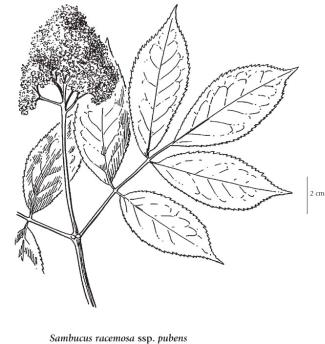 arborescens – N to AK and YT and S to CA; var. melanocarpa – E to AB and S to NM, AZ, NV and N CA; var. leucocarpa – E to PQ and NB and S to TN and GA.
A shade-tolerant to shade-tolerant/intolerant, sub montane to subalpine, circumpolar deciduous shrub (transcontinental in North America). Occurs on fresh to very moist, nitrogen-rich soils within boreal, temperate, and cool mesothermal climates; its occurrence decreases with increasing elevation. Scattered to plentiful in open-canopy forests on water-receiving sites. Indicative of rapid decomposition of forest floor materials (originally Mor humus forms) remaining on cutover or fire-disturbed, water-shedding sites. Usually associated with Alnus rubra, Athyrium filix-femina, Epilobium angustifolium, Rubus parviflorus, and R. spectabilis. A nitrophytic species characteristic of Moder and Mull humus forms. 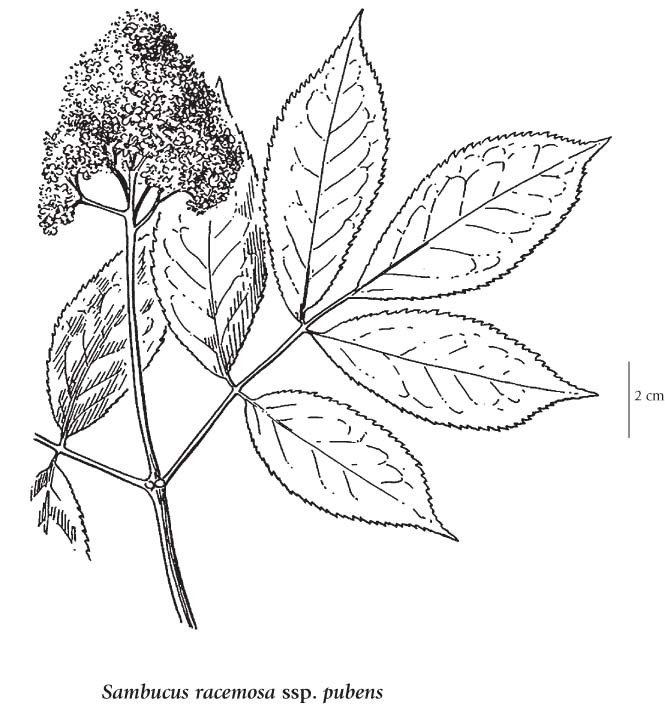 Sambucus racemosa var. laciniata W. D. J. Koch ex DC.